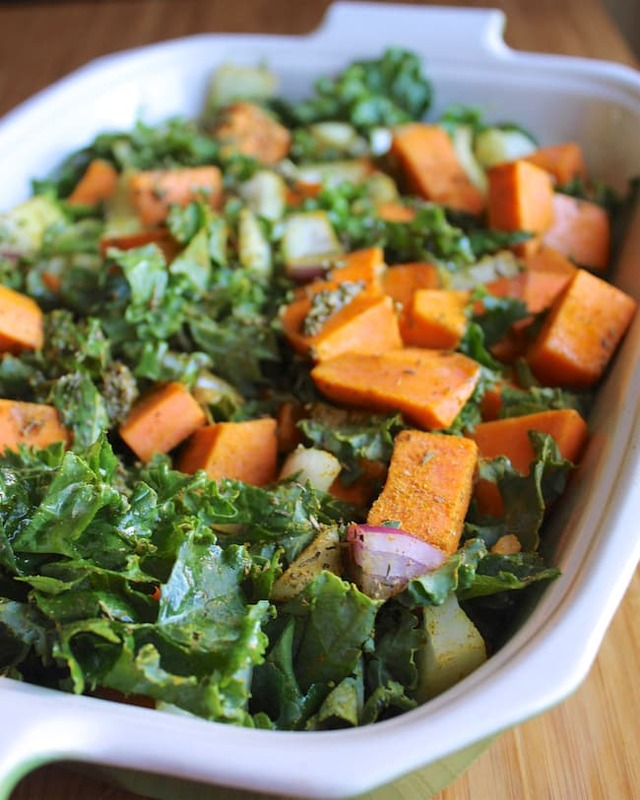 This Gluten-Free Kale & Sweet Potato Bake can be served as a vegan and paleo side dish. 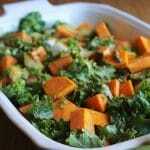 Everyone loves it because of the hearty and delicious sweet potatoes. This dish is kind of like a casserole in that you can just combine the ingredients ahead of time and then bake it when you’re ready to eat. 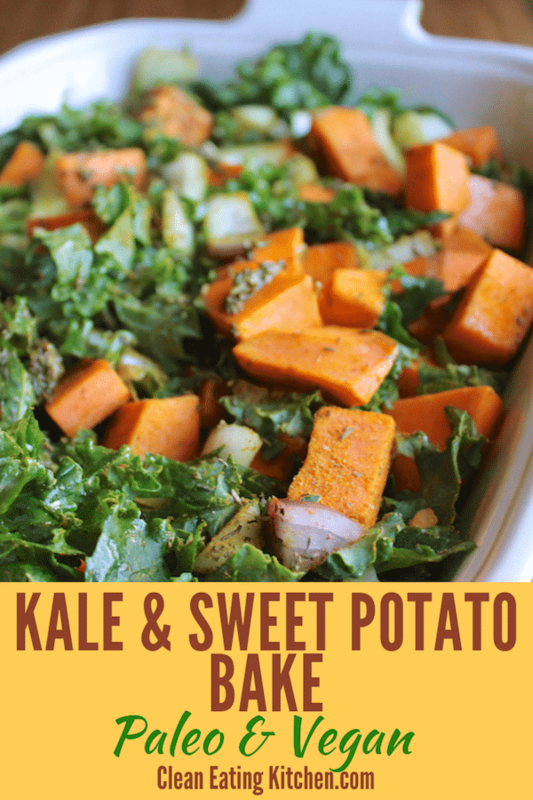 It has three real ingredients: kale, sweet potato, and onion. The coconut oil, salt, pepper, and a sprinkle of ground cinnamon and thyme are optional! The steps to make this dish are really easy. Peel and chop your sweet potatoes. Chop the onion, and kale, and toss it all with your choice of oil and spices. 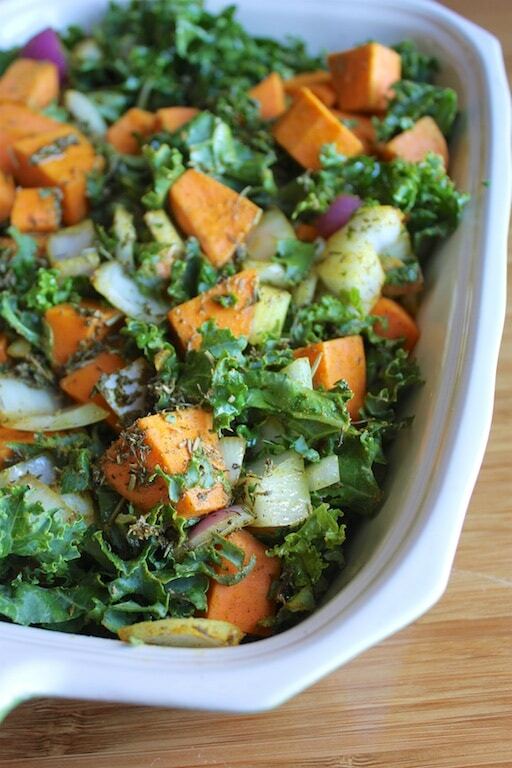 There is a really nice mixture of sweet potatoes and kale in this casserole, along with the great flavor and texture of the onion. I love the sweetness and heartiness from the potatoes, with the extra savory flavor from the kale and onion. The kale does get cooked down during the baking process, but it’s still a nice-looking dish that you can serve at holidays or family gatherings. Your friends on a paleo, vegan, Whole30, or real food diet will love you for making this. I like to serve it as a nice side dish, and the leftovers heat up nicely too. I originally shared this recipe back in 2015, but I’ve updated it with a how-to video! This easy casserole can be served as a main or side dish. Peel and chop the sweet potatoes into approximately 1-inch cubes and place in a large mixing bowl. Chop the kale and onion into bite-sized pieces and add to the bowl. Pour the melted coconut oil over the mixture and stir to combine. Pour ingredients into a baking dish and cook for 45 minutes or until potatoes are fork-tender. And, here’s an image to save to your favorite Pinterest board! Looks healthy and yummy! Thanks, Carrie!!! 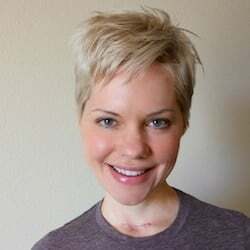 Unbelievable, but true: We had a sweet potato and a bunch of kale and had no idea what we should do … and then your blog post arrived in my inbox! We chopped ’em up and made your dish. Our lunch was delightful, thanks to you. Made my day with such a nice compliment…thank you!!! I make a very similar dish but more savory with chili pepper powder and flakes. I stir fry it on the stove top but looks like I need to try baking this in the oven! OMG! A masterpiece. I love the 3 ingredients, the simple steps. It doesn’t get any easier than this. This will be on my Thanksgiving table for sure. Keep these simple yet perfect recipes coming. Thanks for the sweet words, Paula. Happy Thanksgiving to you!!! XO. I tried this dish and feel like it might be my next addiction. I made it with a side of quinoa and chicken breast and made a nice bowl out if it. The kale and sweet potato gave a nice flavor to the quinoa. Thank you!!!! That’s GREAT, Diane! Sounds like a wonderful bowl you made. XO! No need to do a research because your website constantly provides yummy recipes.